Charlotte County’s only incorporated city, Punta Gorda is a historic waterfront town which approximately 18,000 residents call home. Situated at a point where the Peace River meets Charlotte Harbor, Punta Gorda is approximately 100 miles south of Tampa and 25 miles north of Fort Myers, making it readily accessible by sea and land. One of Florida’s oldest, the community was founded in 1886 and was first known by the name Trabue. The name was changed to Punta Gorda (Spanish for “Fat Point") in 1887. As the furthest point south on the Florida Railroad, Punta Gorda was the starting point for south Florida tourism and development. This historic harbor town is proud of its heritage and you can see this in the many wall murals which adorn the city. > CNN Money – named Punta Gorda in its top 10 of turnaround towns in the USA in 2011. > Money Magazine – placed Punta Gorda in the top 10 small cities in America to live multiple years, 1996, 2003 and 2007. You can enjoy the nearly 3 mile harbor walk which leads to Fisherman’s Village, a waterfront shopping area which houses more than 40 locally owned shops and restaurants. Fisherman’s Village is also home to the always popular Annual Lighted Boat Parade which takes place each December. The largest industry sectors within Punta Gorda include construction, design, retail, hospitality, real estate, health services and tourism, offering businesses year round clientele. With the welcome influx of “snowbirds” finding refuge from the cold up north, many of the small businesses within the area experience a peak season during November through March. 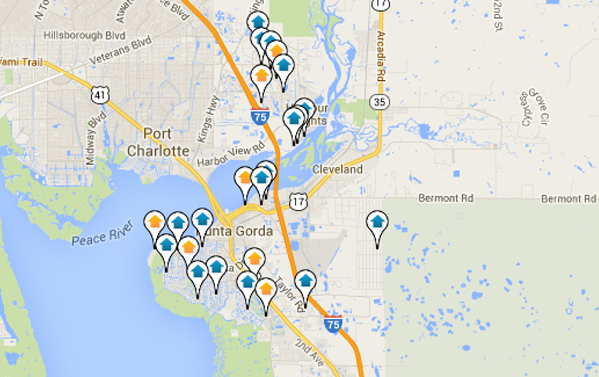 Punta Gorda, A friendly community with a remarkable past and an exciting future. Be a part of it, search our easy to use search features here and/or contact The MLS Detectives Group to discuss your personal housing interests. Eagle Point Mobile Home Park SubDv.